The more open the data, the greater the potential for civic innovation. All three authors are researchers with Geothink.ca. Toronto is buzzing with Google's Sidewalk Labs' announcement of a $50-million investment in a 12-acre waterfront site. With the goal of deploying its smart city technology, this public-private partnership between Waterfront Toronto and Sidewalk Labs, called Sidewalk Toronto, is the first of its kind and the development will be the largest smart-city district built in North America. Smart cities use digital sensors and mobile phone technology to gather urban data about everything from traffic congestion to the route preferences of individual cyclists. This data can then be used to inform policy and municipal operations decisions that can make cities safer and their governments more efficient and effective. Many communities in Canada have active smart city projects underway, from Lethbridge, Alta. to Montreal, Que. to Stratford Ont., but until the Sidewalk Toronto news broke, many Canadians may have been unaware of the degree to which our governments have adopted smart city technology. This Toronto project has important goals, including offering a "superior quality of life" and building an affordable housing development that is energy efficient with many transportation options. 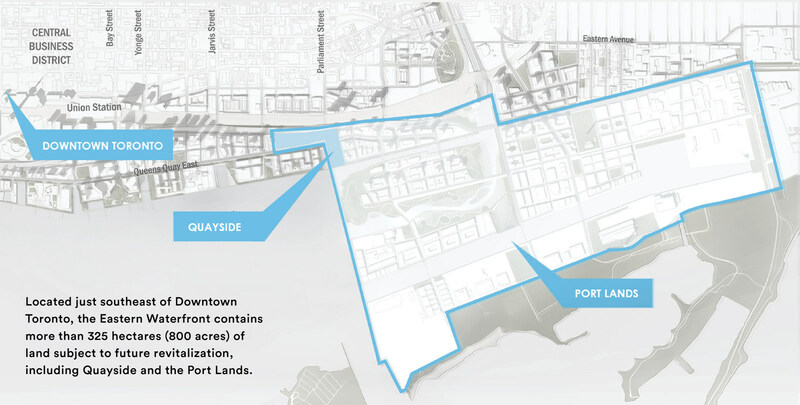 Waterfront Toronto and Sidewalk have high hopes for this proof-of-concept development. If they build it, others will come, learn, return home and do the same. Early critics of this partnership have rightly raised concerns about the privacy issues arising from this large data-gathering exercise. Sidewalk Toronto's "Approach to Privacy" is publicly available on its website. In the smart city, privacy is a vital concern but vast quantities of collected data will not be personal. With this data, an equally vital concern is openness and transparency. The planned location of Sidewalk Toronto on the city's eastern waterfront. Waterfront Toronto was created by the government of Canada, the province of Ontario and the city of Toronto. The three levels of government have active "open by default" commitments which means that all data and information should be publicly available unless there are privacy, security or legal concerns. The goal of open government and data is more transparency, accountability and accessibility. But there is big money in big data that smart city networks gather and Sidewalk Labs is here to do business in Toronto. A big tension in this partnership is who owns the data this smart city network gathers, how will it be analyzed, and how much of the data and algorithms will be openly shared? The more open the data, the greater the potential for civic innovation. Toronto has never been more ready to join this conversation. There are many eager participants. With its city-wide reach of 100 branches, the Toronto Public Library offers programs that make technology accessible to beginners through expert users. Toronto's thriving technology sector is supported by research and innovation incubated in its eight post-secondary institutions. With the world watching and learning, Waterfront Toronto and Sidewalk Labs could prove that their smart city is smart for all, not only some. We have another asset to leverage: the informal civic technology sector. In the two-and-a-half years since it started, CivicTech Toronto draws 75-100 people on Tuesday nights who volunteer their time to see how design and technology can find solutions to civic challenges (e.g., apps to track municipal spending). On Monday, Code for Canada welcomed its first cohort of fellows who will design and technology teams to help governments find solutions to problems. For the formal and informal tech sector to add value, the key ingredient is open data. Waterfront Toronto has a strong record of creative civic engagement. In 2006, Quay to the City was a bold and temporary redesign of Queen's Quay to prove that more pedestrian space and bike lanes could co-exist with transit and car traffic. Waterfront Toronto has built award-winning public spaces that have benefited from a public peer review process. What's the smart city equivalent of the Waterfront Design Review Panel? This public review also relies on transparency of process and data. Open data is required to hold Waterfront Toronto accountable should anything go wrong. It's easier to seek public input on a new park than unpack the black-box processes and algorithms whose outputs will impact the new residents of Quayside. If Sidewalk Toronto is ambitious about democracy, it could set the pace for a new kind of smart city planning process that not only delivers on the potential of the technology but also creates a new best-in-show standard for openness and transparency around data collection, analysis and use. With the world watching and learning, Waterfront Toronto and Sidewalk Labs could prove that their smart city is smart for all, not only some.